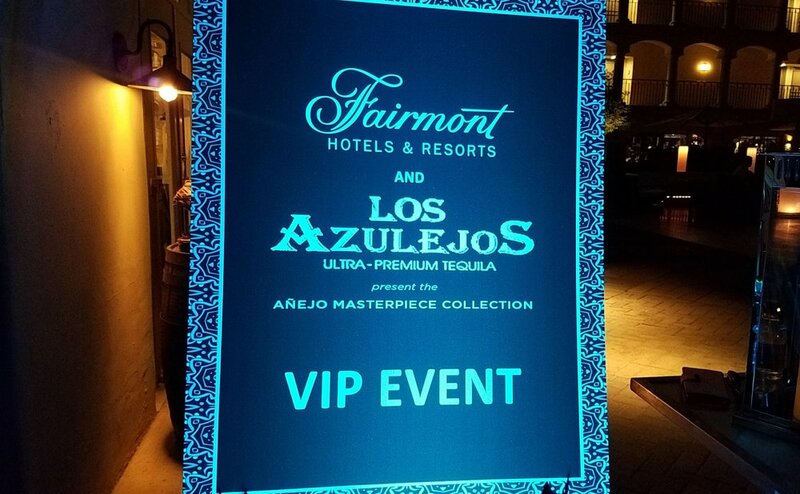 Fairmont Hotels & Resorts recently announced their new tequila partner, Tequila Los Azulejos, and on October 27th, the Fairmont Scottsdale Princess threw a party to celebrate. Los Azulejos will be offered in more than 20 Fairmont hotels throughout the United States and Mexico, and by 2017 this will include Canada, Bermuda and Barbados. The special event was hosted by Kevin Frid, chief operating officer for North & Central America, as well as Tequila Goddess Katie Schnurr and new Rum Princesa Dre Fountain. We were welcomed to the event by Beverage Director Matthew Doerr, who described the cocktails we would be sampling made with this ultra-premium 100% Blue Weber agave spirit produced in the town of Tequila, Jalisco. We also learned that the silver and reposado tequilas come in hand-blown glass bottles, while the añejo is packaged in colorful hand-painted talavera pottery bottles signed by the individual artists. Esta Noche by Jose Garcia from The Plaza Bar: A refreshing tequila mule made with Los Azulejos anejo, fresh lime juice and ginger beer embellished with ruby port and agave nectar. Flaming Los Azulejos Coffee by Eden Williamson from La Hacienda by Richard Sandoval: A warm coffee cocktail with Los Azulejos reposada, 1921 Tequila Crema, and coffee crowned with whipped cream and chocolate shavings. Pineapple Smoke by Kenny Hansen from Michael Mina’sBourbon Steak: My favorite of the night, this combined Los Azulejos reposado with lemon, syrup made from pineapples grilled over mesquite wood, Angostura bitters, and cilantro. Guava Caipirita by John Wilhelm from Toro by Richard Sandoval: A delicious sipper of Los Azulejos blanco, lime, velvet falernum, and guava puree shaken up with egg white and garnished with bruleed guava. Of course, since this was the Fairmont Scottsdale Princess, no guest at this party went hungry. We feasted on dishes such as pork tacos with pasilla and guajillo chile, Wagyu steak with mole poblano, amberjack ceviche with habanero and pineapple, shimp cocktail and a raw bar of clams, oysters, and crab legs. An enticing array of desserts included churros, ricotta donuts, fritters made with Negra Modelo beer, and foie gras cotton candy. To commemorate their partership with Los Azulejos, Fairmont Scottsdale Princess will offer the four specialty cocktails through Nov. 15, 2016. Visit La Hacienda for the Flaming Los Azulejos Coffee, Bourbon Steak for the Pineapple Smoke, Plaza Bar for Esta Noche, and Toro for the Guava Caipirita.